Solo exhibition of Keith Piper's hosted by the Bluecoat, Liverpool, comprising new digital works, large-scale installation and drawings. A Bluecoat/Iniva collaboration. Image: Keith Piper, Unearthing the Bankers Bones, 2016, video still. Courtesy the artist. Iniva, in partnership with Bluecoat, is delighted to present a major solo exhibition by Keith Piper, celebrating the longstanding relationship between the artist and the two institutions. ‘Unearthing the Banker’s Bones’ comprises three new large-scale works spanning installation, digital works and drawings that address current anxieties about the impacts of globalisation. 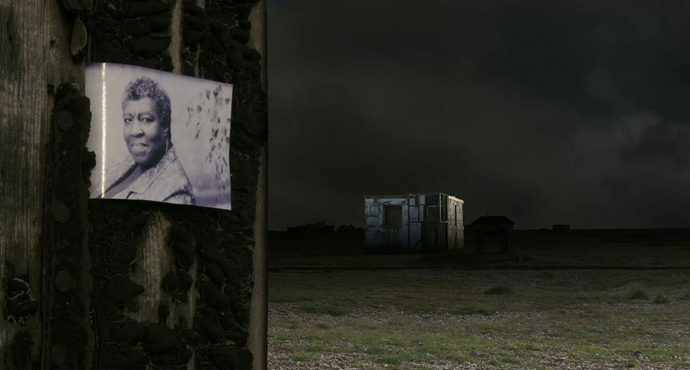 It is Piper’s first monographic show since ‘Relocating the Remains’, produced by Iniva and held at the Royal College of Art in 1997, and continues to explore the social and political concerns that have informed Piper’s practice from the very beginnings of his career as part of Britain’s BLK Art Group in the 1980s. Lending its title to the exhibition, the centrepiece of the show is a new Arts Council Collection 70th Anniversary commission comprising of three synchronised high definition video projections, which depict a narrative of economic and social collapse. Drawing on extracts from apocalyptic works by Octavia Butler and Mary Shelley, the film employs a science fiction device which invites viewers to imagine the excavation and dissection of modern life from a future point in time. Alongside the film, ‘physical evidence’ such as ledgers belonging to the banker of the title, are displayed. These objects play off against the unfolding narrative of the film. Other highlights of the exhibition include Robot Bodies, Piper’s 1988 seminal interactive digital work – updated and re-programmed for this exhibition – in which the robot, android and cyborg are examined as metaphorical carriers of contemporary anxieties around racial difference; and a series of mixed media works on un-stretched canvas, ‘future projected history paintings of the present’, that reference 19th century history painting and have been commissioned by Bluecoat and Iniva. ‘Unearthing the Banker’s Bones’ is a national and international touring exhibition with future dates and locations to be announced. If you would like to find out more, please do not hesitate to contact us (details below).